Fine brass rings are used for signals and can be plated with silver, gold or rhodium where low contact resistance and low noise levels are required. The best results are obtained when these precious metal surfaces are used in conjunction with silver-graphite brushes. These units are suitable for slow speed only when fitted with brass rings. 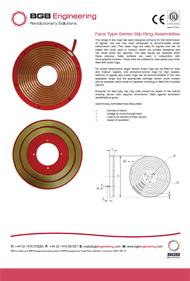 Standard face type slip rings are available up to 18 ways and a diameter of 280mm.